So I’ve been complaining for a while about how arbitrary most attempts to judge fitness are. The Crossfit Games, for instance, is clearly the best fitness competition, but you still need to master a lot of ‘skill’ movements to do well in it: from the Olympic lifts (high-skill movements that certainly test power but take years to properly learn) to kipping pullups and muscle-ups (more about efficiency of not-very-transferable movement than anything) to handstand walks (I’m pretty good at these, probably better than you, but I still don’t think there’s much point in practicing them) to double-unders (same as handstand walks). What these things really test is just how much of your precious time on this earth you’re prepared to spend learning skills that have little transfer to anything real. Consider this: if you spent more time this year working on double-unders and snatches than you did learning to breakfall or swim or climb up a building or punch somebody, you are wasting valuable be-more-like-Batman time. Just so it doesn’t seem like I’m picking on Crossfit, I should mention that I don’t think there are any other decent all-round tests of fitness elsewhere, either. The NFL Combine gets no respect even among NFL players – it’s really a question of how well you can game a system that doesn’t really test any qualities you need in the NFL. Powerlifting tests how strong you are, but also your technique in two highly technique-dependent lifts (and the deadlift). Marathons are a great test of how fast you can run a distance you’ll probably never need to run, Olympic lifting tests how well you can manoeuvre a lovely straight bar around your body, and I quite like strongman comps but there’s no denying that you can win one while still looking (and wheezing) like a circus fatman. At this point, angels sang. I could make my own fitness challenge. It should be a tribute to Patrick Swayze. Why Patrick Swayze? Because he lived hard. His dad was a rodeo champ, and his mother was a dance teacher. He was offered dance and athletic scholarships when he went to college, and learned to skydive for real when he made Point Break. He did gymnastics, and he could surf, and fight. He was, apparently, a nice guy. He was awesome. 1. You have to do all the below tests over the course of a weekend. The order doesn’t matter, and you can do them all back to back, or spread them out. Just get them done. And since the point is to test for weaknesses, you should probably do them this weekend. Don’t train for this: it’s supposed to be a reflection of how your training has prepared you for life, not how well you can prepare for a set of tests. 2. The Barber College Challenge works on the honour system. Yes, you can use RunKeeper or your camera or whatever to document your scores – and that’s what I’ll be doing – but you don’t have to. Again: this is about improving your life, not showing off. 3. There are only two rules. Cool? Cool. Onto the challenge! BUY-IN: Diving forward roll over something. Aha! Maybe you’re already out! But you shouldn’t be. Swayze could definitely do a forward roll. Everyone should be able to do a forward roll – and if you can’t, congratulations, you just discovered a weakness that you can improve instantly. I chose a Reebok step to dive over, but you can go smaller or bigger if you like. Try a shoe! A water bottle! A picnic table! And if you can’t do one, work on it. Now: the actual events. I’m not posting standards for these, because, really, there are lots of reasons why you’d be better or worse at some of them, and I don’t want anyone getting discouraged. Remember: the only failure is not caring how good you are at any of these things. The most Swayze-endorsed of all the events. Anyone who says they’ve never wanted to recreate the final scene from Dirty Dancing is a goddamned liar, and this is the closest you’ll get in the gym. Well, technically a push-press would be closer to the actual dance move – but going heavy on those gets a bit sketchy form-wise. So here you are: no leg drive, just a strict press overhead with a barbell. Better than a bench press, because it tests your core and stability. Yes, you need a gym for this, but you can probably get a day-pass from somewhere. Non-gym workout regime hasn’t prepared you for this? Do more handstand press-ups. Because Roadhouse-Swayze didn’t get in throat-ripping shape with curls. The rules are simple: straight arms at the bottom, whole head goes over the bar at the top, your attempt ends when you fall off the bar, and you should use absolutely minimal amounts of kicking. Yes, you’re going to wiggle your legs a bit if you go for a proper max, but no ‘kipping.’ You’ll know in your heart whether you do this properly or not. And Swayze knows too. Honestly, I’d rather this was an all-out-effort on a Sonic Blast Man punch-machine, but they’re a bit of an endangered species these days. Instead, do these, strict: chest touches the floor at the bottom of the rep, arms are straight at the top. You can ‘rest’ in downward/upward dog, but as soon as any part of your body touches the floor except for your hands, toes and chest, the attempt is over. As much as anything, this will let you know if you’ve been slacking at the gym – almost anyone can do pressups almost anywhere, so if you’re terrible at them it’s essentially because you don’t do them enough. And when the lactate builds up, remember: pain don’t hurt. Oh yes. It’s a key part of Roadhouse Swayze’s credo, and an essential part of life. I’ll leave it to you to decide what this means – perhaps you’ll help an aging couple with their gardening, or bring the concept of caffé sospeso to your local coffee shop. Perhaps you’ll spend the weekend working on your empathy…or perhaps you’ll skip the last part of the challenge entirely. If it’s the last one, please consider what Dalton would think of you. HOMEWORK: Do the challenge! And remember: it’s not what score you get, it’s what that score tells you about your weaknesses and strengths. Post scores, thoughts and results in the comments (or via the Contact form if you’re shy). Either way, know that if you give it your all, Swayze would be proud. UPDATE: Thanks to a few kind people who’ve contacted me since this went live, the winner will actually get a pretty sweet prize package, including goodies that I’ll mention in the follow-up to this. 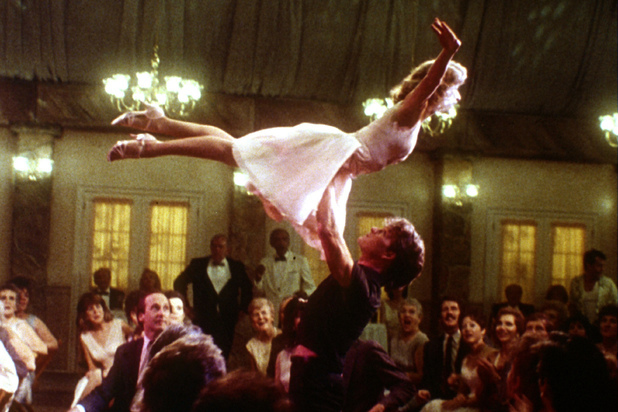 GET SWAYZE-ING. First of all I just want to say I love LiveHard. Thank you. I’ll be giving the challenge a crack over the weekend. My girlfriends currently treating me to the Dirty Dancing soundtrack to get me in the zone. Good man, Matt. You can’t beat a bit of Hungry Eyes. Really enjoyed the challenge man. Well, apart from the run. Nice work Matt! Good numbers – er, I assume you mean 54 pressups? And did you manage the ‘Be Nice’ part? Sorry Joel I just checked this, I tried to send a reply from my phone but it clearly didn’t go through. Yeah I meant press ups. And I bought my girlfriend some macaroons which made her very happy. How’s everyone’s numbers adding up?